Acumatica Singapore: Cloud Fixed Assets. Split, Transfer, Change of Useful Life, Accelerated Depreciation and more. Cloud Fixed Assets. Split, Transfer, Change of Useful Life, Accelerated Depreciation and more. In Acumatica version 4 FA module was greatly reworked and improved. Original goal was to make it better than JDE. You are the one to judge. The module is used by KFC/Pizza Hut for nearly 20,000 assets around 200 locations island-wide. One step solution for that - Asset Split process. Second type is when we have to Sell the Asset in location A and re-purchase it at cost on location B. You may notice Disposal Method, that will be used to write off the asset during the transfer. Its because second method require sender company to get rid of asset in their books completely. 3. Change of Useful Life (UL). There are two ways of changing the useful life of an asset. Either re-depreciate it from the beginning of life of the asset, and then, posting difference to the period of UL change. Or use so called "accelerated depreciation" mode to spread remaining Net Book Value of the asset over remaining life of the asset proportionally. Depreciating in a nicer and more flat manner. 4. Cost Additions and Deductions. It is clear that some assets may get additions. Like for a PC we can buy a new HDD or RAM upgrade. This is usually managed by changing the asset cost at certain point of parent asset life. 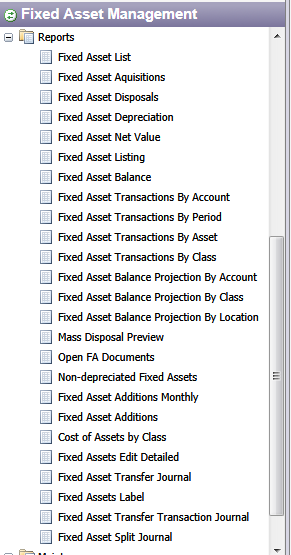 In Acumatica we have a dedicated transaction type and screen to process asset cost additions OR deductions.